We do everything from bug fixing to coding high performance, multinational shopping carts. No job is too small or too large and we are passionate about building high quality, successful solutions. We use Opencart, which is one of the Worlds most popular opensource eCommerce website systems. With Opencart you benefit from over 15 years of experience, access to over 16,000 powerful extensions and an easy to use administration console. 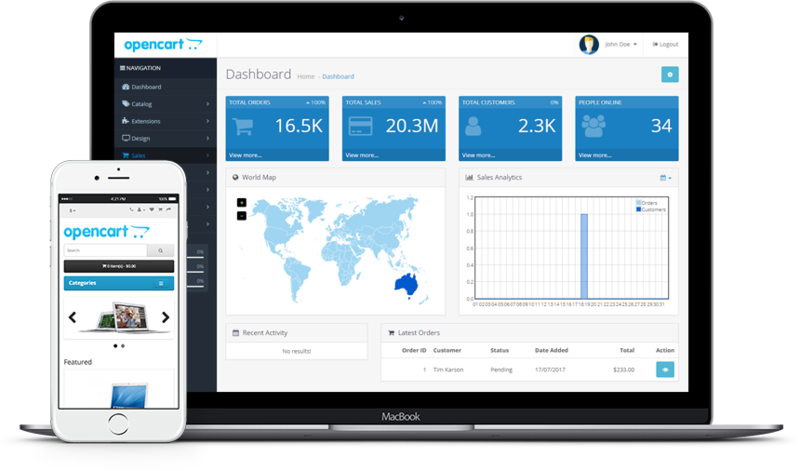 Opencart is used by many of the worlds most successful home eCommerce businesses as well as medium sized traditional retailers. Whether you simply need a simple shopping cart for your local shop or your manufacturing business has global ambitions we can help. Our ecommerce platform can be used as a simple and effective way to drive customers to your shop, create a customer community online or extended to support multiple languages, currencies, stores, and tens of thousands of products. If you need some help with your Opencart install please give us a buzz. We can normally sort technical issues quickly and can help with any requirements around design, marketing, integration and development as ad hoc, or and ongoing support contract. If you need some quick support, or have a project give us a call on 0800 292739 and see if we can help.